Yesterday we had Restrepia trichoglossa and today we have another Restrepia to highlight the great diversity there is in the genus. Restepia muscifera is a much larger and broader flower than Restrepia trichoglossa and our clone is a wonderful strong pink colour. 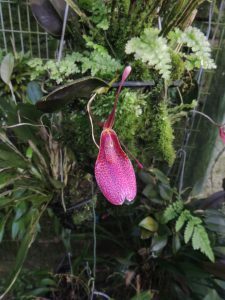 This plant is larger growing than Restrepia trichoglossa with the dark green leaf + stalk reaching 20cm. The species is variable and is found through Central America, Colombia and Ecuador. We could have a whole week of Restrepia species (we have thirteen species in flower today) but as they repeat flower throughout the year we will save the rest for later posts.